Hajimehdipoor, H., Naghibi, F., Bandidarian, A., Moazzeni Zehan, H., Pirani, A., Hamzeloo-Moghadam, M. (2014). Evaluating the antioxidant and acetylcholinesterase inhibitory activity of three Centaurea species. Research Journal of Pharmacognosy, 1(1), 33-37. H. Hajimehdipoor; F. Naghibi; A. Bandidarian; H. Moazzeni Zehan; A. Pirani; M. Hamzeloo-Moghadam. "Evaluating the antioxidant and acetylcholinesterase inhibitory activity of three Centaurea species". 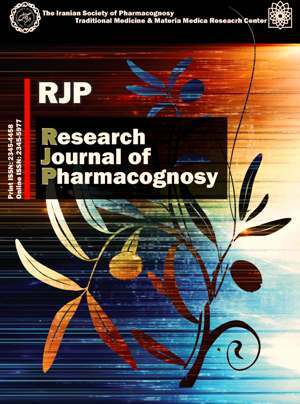 Research Journal of Pharmacognosy, 1, 1, 2014, 33-37. Hajimehdipoor, H., Naghibi, F., Bandidarian, A., Moazzeni Zehan, H., Pirani, A., Hamzeloo-Moghadam, M. (2014). 'Evaluating the antioxidant and acetylcholinesterase inhibitory activity of three Centaurea species', Research Journal of Pharmacognosy, 1(1), pp. 33-37. Hajimehdipoor, H., Naghibi, F., Bandidarian, A., Moazzeni Zehan, H., Pirani, A., Hamzeloo-Moghadam, M. Evaluating the antioxidant and acetylcholinesterase inhibitory activity of three Centaurea species. Research Journal of Pharmacognosy, 2014; 1(1): 33-37. 1Traditional Medicine and Materia Medica Research Center, Shahid Beheshti University of Medical Sciences, Tehran, Iran. 2Traditional Medicine and Materia Medica Research Center, Shahid Beheshti University of Medical Sciences, Tehran, Iran. Pharmaceutical Sciences Branch, Islamic Azad University, Tehran, Iran. 3Department of Traditional Pharmacy, School of Traditional Medicine, Shahid Beheshti University of Medical Sciences, Tehran, Iran. Factors such as oxidative stress and reduced acetylcholine level have been implicated in Alzheimer’s disease (AD) pathology and recently there has been a trend towards natural product research to find potential sources of antioxidants and acetylcholinesterase inhibitors in the plants kingdom. Centaurea is a genus with about 500 species world wild, many of them have shown to possess biologic activity; Centaurea albonites, C. aucheri and C. pseudoscabiosa are three species which little investigation has been carried out about their biological properties. In the present study, the antioxidant and acetylcholinesterase inhibitory activity of the above mentioned species have been evaluated. The ability of the total extract and methanol fraction of the plants to scavenge free radicals has been assessed through DPPH radical scavenging assay, and the acetylcholinesterase inhibitory property has been evaluated by Ellman method. The total extract of all species exhibited moderate antioxidant activity whereas the extracts of C. pseudoscabiosa showed the strongest antioxidant property; its total extract also demonstrated the highest acetylcholinesterase inhibitory activity among the evaluated samples (19.2% inhibition). The results suggest the species as potential sources of natural antioxidants which could be focused in future studies of Alzheimer’s disease.